Jaguar’s famous motor sport heritage is to be celebrated at this year’s Goodwood Festival of Speed, in England, with an irreplaceable array of its most prestigious cars. With models from the 1950’s to present day, the crowds will be left in no doubt that Jaguar remains an icon of British motor manufacturing. Taking to the Goodwood hill will be Jaguar’s Le Mans-winning XJR-9. Powered by the Jaguar V12, the XJR-9 earned its place in the history books after claiming first, fourth and sixteenth place at the 1988 Le Mans 24 Hour Race. 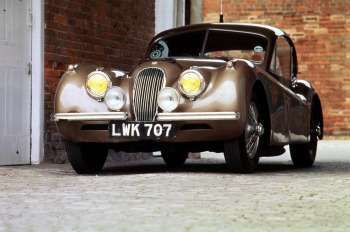 Other cars gracing the hallowed hill climb will be the record breaking XK120 ‘Montlhéry’ Fixed Head Coupé. Famous as the ‘Seven Days and Seven Nights’ car driven by Stirling Moss, Bert Hadley, Jack Fairman and Leslie Johnson, the car averaged 100.31mph (161.43 km/h) for seven days and nights covering 16,851 miles. Joining the XK120 in the ‘Classic Endurance Cars’ group will be the 1956 long nose D-Type which this year celebrates the 50th anniversary of an unparalleled 1-2-3-4-6 finish at Le Mans in 1957. Finally in the International Sports Cars category Jaguar will be entering the stunning and unique XJ13. Not only will Jaguar be paying homage to its illustrious racing past, it will also be demonstrating the supreme ride and handling of today’s award winning XKR; one is a standard factory specification model in the expert hands of Jaguar’s Driving Dynamics expert, Mike Cross and the other a specially modified PalmerSport XKR, usually found racing around the Bedford Autodrome corporate circuit. This 420 bhp, 4.2 litre V8 supercharged car has been stripped of its luxury interior and fitted with uprated brakes and a lowered, stiffened suspension. The Goodwood Festival of Speed is open from Friday 22nd June to Sunday 24th June, 2007. All Jaguar cars will be on display and heading up the famous Goodwood hill climb.